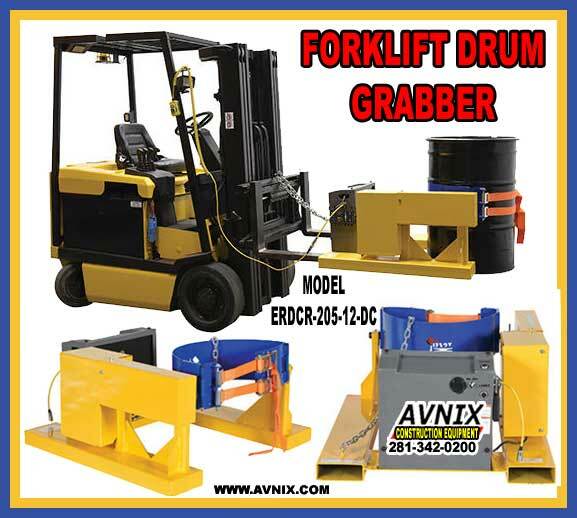 Avnix forklift drum attachment allows you to easily transport and rotate 55-gallon steel drums using a forklift truck. Each drum grabber attachment comes with a 15 foot long chain to allow the drum to be rotated up to 360° from the forklift drivers seat. Fork pockets measure 7-5/8″W x 2-5/8″H usable, except ERDCR-205-8 and ERDCR-205-15 usable is 7″ W. DC powered units include (2) two 12V batteries, on-board charger, and hand held control on a 4 ft. to 20 ft. long coil cord. 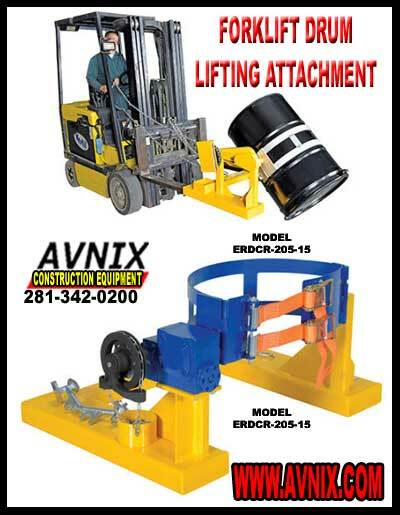 Safety restraint is used to secure attachment to Forklift. Bung Nut Wrench, model ERBNW-I, is also included for opening and closing drums. Forklift Drum Attachments clamp or grip attachment to the forks, this attachment is useful for lifting and transporting round containers like drums. It is also offered in a type that is attached to the carriage in place of the forks. Still another type is known as a “drum tine” and consists of concave cylindrical bars which are extensions of the forks and move a drum in a horizontal position. Most forklifts can do more things than lifting products onto pallets with the help of a forklift attachment. After you’ve purchased a forklift for a particular job you will soon find out that your fork truck can handle a lot more jobs than you initially anticipated. Or, the needs of your company may change or increased business and you need to make more demands on your forklift. The best cost effective way of making these changes is the use of forklift attachment. Many fork truck attachments fit on forklifts allowing the forklift to do more than just lift pallet loads. 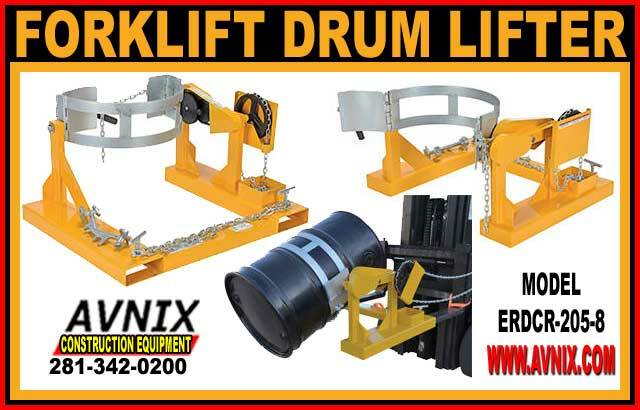 One of those is a forklift drum attachment that can clamp, grip, transport and rotate 55 gallon drums. Turns Per 90 º Rotation Wt.